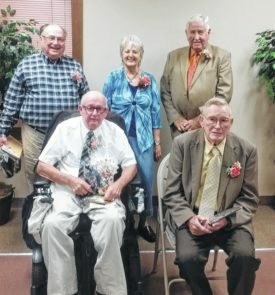 GALION — Crawford County’s Council on Aging inducted five new members into the Crawford County Golden Years Hall of Fame. on Oct. 18. The outstanding senior citizens were Rev. Lewis Copley of Galion, James Croneis of Bucyrus, Carol Kable of Galion, J. William (Bill) Stepro of Galion and Carl Watt of Galion. It has been 14 years since the Council on Aging honored outstanding senior citizens in this way. In 1978, the first 14 senior citizens were inducted into the Crawford County Golden Years Hall of Fame, with a total of 226 senior citizens inducted from 1978-2001.
Letters were sent to clubs, churches and community organizations asking for nominations this year. Nominees must be currently living in Crawford County; must be age 60 or older; and them must possess distinctive service to the community for their efforts in the past and present, while making Crawford County a better place to live. The names of all honorees are inscribed and displayed in the entry hall of the Senior Center. Each io listed in a book, displaying their picture along with their submitted biographies. A welcome, invocation and introduction of nominees were provided by Pastor Mike Corwin of Bucyrus United Methodist Church. Don Wilson, vice president of the Council on Aging Board of Directors presented the plaques and shared comments alongside Cassie Herschler, Executive Director of the Council on Aging. For information on the Crawford County Council on Aging, call 419-562-3050.